If the player’s ball lying anywhere on the course is believed to be covered by sand, to the extent that he cannot find or identify it, he may, without penalty, touch or move the sand in order to find or identify the ball. If the ball is found, and identified as his, the player must re-create the lie as nearly as possible by replacing the sand. If the ball is moved during the touching or moving of sand while searching for or identifying the ball, there is no penalty; the ball must be replaced and the lie re-created. The PGA of America Rules Committee had no option but to disqualify him under Rule 6-6d, for signing and returning a score card with a score for a hole lower than was actually scored, due to not having included the penalty strokes incurred. Kudos is due to Michael Hoey for his integrity in bringing his breach to the attention of the officials, knowing that the inevitable outcome would be his disqualification. However, I despair of repeatedly having to make the point that it the responsibility of players to know the Rules (Rule 6-1) and this should especially apply to those that make their living from the game. If they do not want to spend the necessary time learning the Rules themselves they should at least employ a caddie who does. Surely a professional caddie has plenty of spare time, for example when travelling, to add this important area of relevant expertise to their qualifications for the job they are paid for. Pettersson was notified of the penalty as he left the fourth tee. His score for the par-4 first hole was a 6." 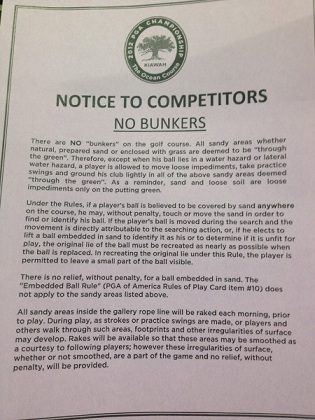 Does your Club have a problem with getting your Juniors to learn both golfing etiquette and the Rules? I have done the work for you. Check out my Juniors Quiz at this link. You made an excellent point about players and their caddies not knowing the rules, especially caddies who are paid well for a job with a lot of down time. It seems the majority of players are surprisingly ignorant of the rules but your point that there is no reason for caddies being equally ignorant is a point well made.